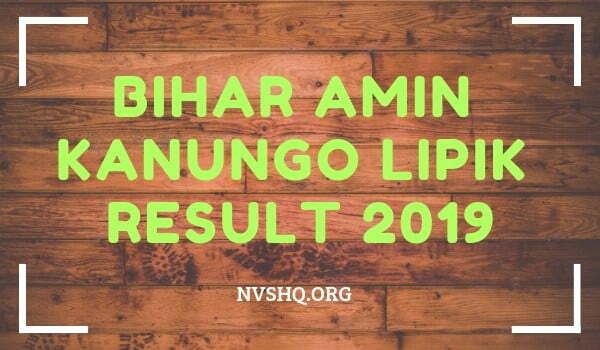 Bihar Amin Kanungo Lipik Result LRC Merit List 2019: The result and merit list for the post of Amin, Kanungo, Clerk, etc. post is under processing and will be out soon. The application procedure has been completed on 1st April 2019. Conducting authority i.e. Department of Revenue and Land Reforms, Bihar Government will announce the result after the scrutiny of the application forms. Result will be published online on departments website on notified dates. For this recruitment, no selection test was conducted. The selection will be purely based on the merit prepared on the basis of marks percentage at various academic levels and work experience of the candidates. 2.2 How to check Bihar Amin Kanungo Lipik result/ merit list? In this article, candidates can read necessary information related to Bihar LRC recruitment 2019. Post Amin, Kanungo, Lipik, etc. Merit list for all the posts will release only through the online mode. No printed result will be send to any candidate on their postal addresses. Candidates who have applied for under this recruitment can access their result at official website on the notified dates. The dates for disclosure of merit list will be notified to candidates via official portal of the department or Email/SMS. Candidates are therefore suggested to keep an eye on official portal and also on their email/registered mobile on a regular basis. Merit list for all the posts will be published separately. The cut-off will be considered while preparing the merit list of the candidates. For all the categories under every post, there will be different cut-off marks. Merit list is supposed to carry the names of the selected candidates in the order of the merit, application number, father’s name, date of birth, category, postal address, marks obtained after evaluation and various other points related to the recruitment. How to check Bihar Amin Kanungo Lipik result/ merit list? Go to the official website first (http://lrc.bih.nic.in). Select the “Results” link given on the left side of the homepage. Click on the relevant result/merit list link. Merit list will appear on screen. Candidates can check their names or registration numbers in the list. Lastly, they can download the merit list for references in future. Selection will be prepared on the basis of marks of the candidates in various educational levels and experience. No written or online test is conducted for selection. Merit list will be prepared on the basis of marks obtained by the candidates in Matriculation/High School, Intermediate, Graduation/ post-graduation, and Work Experience. Merit list for this post is prepared on the basis of weightage of marks of Matric, Intermediate, Graduation, PG, and experience. Matriculation (10 marks), Intermediate (15 marks), graduation (50 marks), Postgraduation (5 Marks) and for experience (5-20 marks). Therefore, total weightage for merit list will be 8+10.5+30+2.5+10= 61 marks. On the basis of the total weightage merit will be prepared. Same criteria will be followed for calculating weightage for other posts. However, marks weightage will be different. In case you have any doubt regarding the Bihar Amin Kanungo Lipik result 2019 and merit list then you can comment below and our team will help you in solving it. Btech wale v to special clerk ke liye eligible hai??? Expected date to get result??? Sir, 75% out of my Clerk/ Special Survey Clerk merit list will be my merit. maine special survey clerk k liye dala tha form… maine btech kr rkha h… but graduation me fill krte waqt btech option me ni tha to science dal diya… perctage sahi dala hai… form reject to nhi hoga na ??? How can we know what would be the cut off ?